'Chatham Breeze' -Thats what we call it! Our lovely Chatham home features cathedral ceilings in the living/kitchen/dining area, with nautical accents throughout. It has two master bedrooms, 4 bathrooms and an outdoor shower. The kitchen has been completely updated, with beautiful white shaker wood cabinets, stainless steel appliances, built in wine cooler, subway tile and gorgeous white granite countertops. All bathroom vanities have been redone with beautiful white shaker wood cabinets. The house has been freshly painted, inside and out. This home is at the end of a quiet Road, nestled into conservation land. We are walking distance to many shops, restaurants and markets. Our home has a finished walkout basement with professional size pool table, game room, seating area with flat screen TV, (great space for a rainy afternoon). There are two outdoor seating areas with a Weber grill for grilling. For the sports enthusiast there is a basketball hoop in the driveway, bocce, and golf clubs. All bathrooms come fully equipped with bath towels, face towels and hand towels. Our family and friends have always enjoyed the comforts of this family home.....we know you will too! Chatham Breeze truly represents what Cape Cod, and more specifically, what Chatham is all about. The property is charming and inviting. All amenities are first class. The location is ideal; walking distance to town, but not in town. With the secluded location, we never heard or saw any neighbors. This is an immaculate, lovely home within easy walking distance to town. Lois was wonderful to work with! Very responsive in advance of our stay, she met us when we arrived and was available throughout our stay to answer any questions. The kitchen is well stocked with all of the essentials so if you want to cook or grill at home, it is a pleasure. The backyard is perfect for relaxing with brand new, very comfortable outdoor furniture. We loved the fact that the house came with plenty of comfy sheets and towels! All in all, it was a perfect vacation in a truly lovely home. Thank you again for providing a superb end-to-end experience. We would definitely recommend this rental to anyone. We just stayed at the "Chatham Breeze" for the week and found it very comfortable and conveniently located. Lois provided almost everything we could possibly need and it was nice to have towels/sheets provided as well. We did bring in our own microwave but that was easiest enough. We would definitely stay there again! Chatham Breeze - Truly, your home away from home! This vacation home met or exceeded every expectation for our family of 5 including 3 teenage boys! 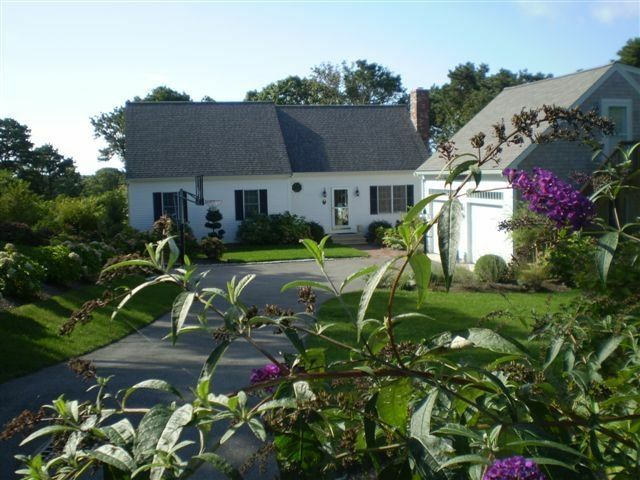 The location is fantastic, because it's on a small cul-de-sac immediately off of and very close to the "heart of Chatham" - convenient to everything! The house is immaculate. We were pleasantly shocked to learn on arrival that there were 6 bikes and helmets all in good working order for our use, in addition to all of the other recreational games provided. The owners' care is apparent in every amenity, detail, upkeep, and cleanliness of the home. Owners are very responsive to emails and texts and a pleasure to work with. We just cannot say enough good things about this home and our experience! We stayed for 2 weeks in July, 2017 and were very impressed. The house is impeccably clean and well stocked. For non-beach days, there is a pool table; air hockey; a foosball table; many board games; and several TVs with full cable. The back deck is great for cookouts and there is a large gas grill. The kitchen is modern and stocked with everything that you would need (dishes, plates, glasses, cookware, cutlery, etc.). All in all, we had a fabulous stay and would highly recommend. Our home is located just a half mile from downtown Chatham and a half mile to Oyster Pond Beach (perfect for small children). Also located near two 5 Star resorts, one mile from Chatham Bars Inn Resort, which offers pool side bar and dining to the public and a public 9 hole golf course. The other resort is the Wequasett Inn, which is three miles away and is also open to the public. It is less than two miles to any other public beach in Chatham. Less than 3 tenths of a mile from several popular Restaurants in town, Longshore Restaurant 0.1, Del Mar Restaurant 0.3, Pates Restaurant 0.2, Red Nun Restaurant 0.5. We are located 0.3 miles to Chatham lobster and Seafood Market, 0.5 miles to Chatham Village Market, 0.1 miles to Liquor Locker and less than a half a mile to the Bike trail. Chatham is very festive at Christmas time and also has an event called First Night on New Years Eve. All the shops downtown are open and lit up, BUT best of all, you can see the fire works display from the back of the deck perfectly. GREAT TIME !!! Other Activities: Half a mile to bike trail and bird watching off deck. Refundable Security Deposit $500.00, cleaning fee $300.00, Linen fee $200.00. Please read rental agreement, sign and send with payment.